Join the global club of folks who have a photo with one of the most recognizable back drops in Venice Beach, The Venice Sign. Wait at the traffic light until the walk signal appears, then run out in front of the sign and strike a pose! You have about a 30 second window to get your shot before the cars start coming. Tag it, Post it, Share it! @VeniceSign and @VeniceBeachFun. Enjoy! ABOUT: Spanning across Windward Avenue at Pacific, the VENICE Sign in lights is a modern day replica of the one originally installed in 1905 by Venice’s founder Abbot Kinney. It is a defining symbol of Venice, past and present. In 2007, the Venice Sign Restoration Project recreated and installed the contemporary version of this historic sign. Since that time the Venice Chamber has been responsible for the sign and for protecting its trademark. The Doors legend and Rock & Roll Hall of Famer Robby Krieger, lights up Venice! 1st Annual Venice Sign Lighting with Robert Downey Jr.
100 Year Celebration of the Venice Chamber and the lighting of the Venice Sign. 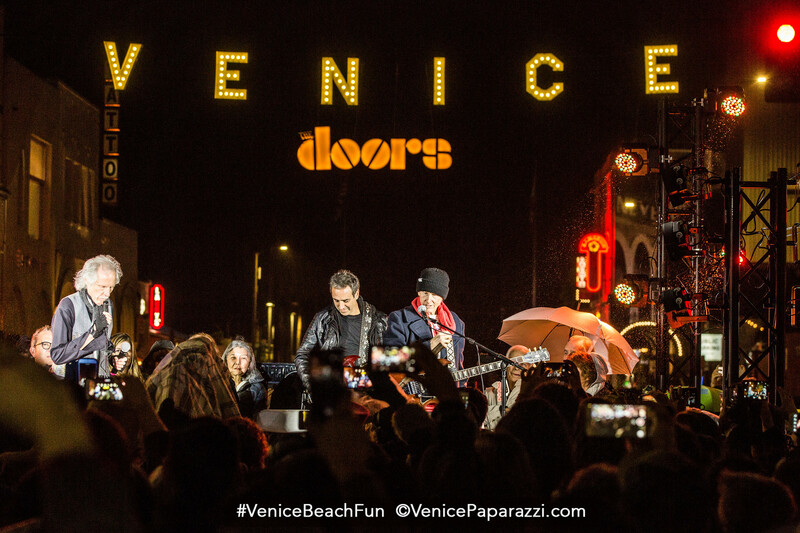 Click here to view all Venice Sign Lighting photo galleries by Venice Paparazzi. Get the official VENICE Sign t-shirt! Be part of the Venice Sign, and adopt a bulb!